oil on board, 24” x 20”, signed lower left, c. 1970. Illustrated: “The Mystic Warriors of the Plains” pg 570, plate 29. Mails is a painter, illustrator and writer. He was born in California and studied at California College of Arts and Crafts and Luther Theological Sem., St. Paul. Mails is best known for painting and illustrating Indian culture and sketching in the Southwest. He collected Indian artifacts and authentically illustrated them in his paintings. He worked in theater and residential design in Oakland and San Francisco and later opened an architectural office in Seattle. 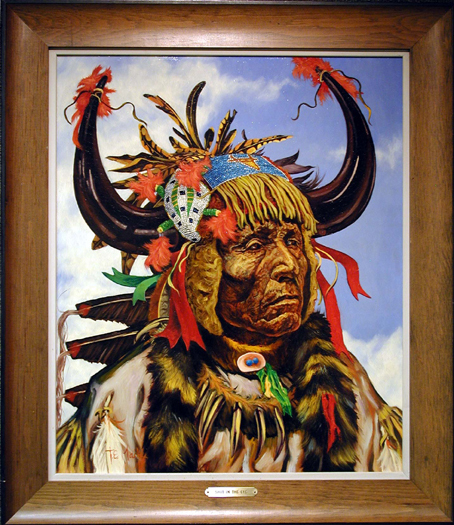 In 1990 he donated 26 paintings to the Kwahadi Heritage Center and Museum, Amarillo, TX who displayed the paintings in a series of traveling exhibits at the Hutchinson County Museum in Borger, TX, Alamosa College in Colorado, the Seton Memorial Library and Museum at Philmont and the Koshare Indian Museum in La Junta, CO. In 1994 he donated almost 100 oils and pastel paintings, 2000 original charcoal illustrations from his books, thousands of photographs from his travels, almost 2000 fine books from his research library, and numerous artifacts. His work is in museums, public and private collections. He is listed in “Who was Who in American Art”; “Master Index 1917-1993; Artists in Southwest Art”; Samuels ”Contemporary Western Artists”; Samuels “Encyclopedia Artists American West” and authored 14 books on Indian people such as “The Mystic Warriors of the Plains”; “The People Called Apache”; “Hotevilla, Hopi Shrine of the Covenant, Microcosm of the World”; “The Mystic Warriors of the Plains”; and “Dog Soldiers, Bear Men and Buffalo Women”. Comments Illustrated in “The Mystic Warriors of the Plains,” page 570, plate 29. This painting is in excellent condition.